But who is scouring through countless instances on the web of San Antonians looking for urban lofts or luxury vehicles? It isn’t a person, it’s an algorithm – written by programmers in downtown San Antonio. Local startup FunnelAI, whose software-as-a-service platform uses artificial intelligence (AI) to home in on social media posts for leads on potential customers, is one example of how AI is increasingly used by businesses. However, AI could have serious implications for many Americans’ livelihoods. More than two-thirds of the country believes AI will eliminate more jobs than it creates, according to a 2018 Gallup survey. A 2017 study by the McKinsey Global Institute found that automation will directly affect a third of U.S. workers’ jobs, and a 2013 University of Oxford study paints an even bleaker picture: about 47 percent of total U.S. employment could be at stake. Advanced manufacturing, one of San Antonio’s economic engines, is likely to be transformed by AI, but it remains to be seen whether automation will eliminate jobs, produce more of them, or something in between. AI has not yet entered the picture for the more than 3,000 workers at Toyota’s manufacturing plant in South San Antonio. The plant’s industrial robots, which do not employ artificial intelligence, are kept in confined areas away from humans to ensure workers’ safety, a spokeswoman said. Collaborative robots, or cobots, such as the ones researchers at the Southwest Research Institute are coding, are programmed to retract when they detect a human and can, therefore, work alongside them without risk of injury to humans. Auto manufacturer Ford has used cobots to build Ford Fiestas at its Cologne, Germany, plant. Still in their nascent stages, cobots could be a boon for the manufacturing sector, said Rey Chavez, president and CEO of the San Antonio Manufacturing Association. For Suja Kamma, co-founder of FunnelAI and its chief operating officer, the impact AI will have on the workforce is analogous to the advent of personal computers. Her father, a civil engineer, began his career before the PC revolution. When computers became ubiquitous, many aspects of his job transformed suddenly, and he had to overcome a learning curve. But he never lost his job because of it, Kamma said. For example, FunnelAI’s most common client is auto dealerships. FunnelAI’s platform typically frees an employee to do other, less menial tasks than manually scrolling through the dealership’s social media accounts for customer leads. Just as the ability to use a computer is a prerequisite for most jobs, the ability to use AI tools might become standard. Developer Vivian Canales demonstrates software at FunnelAI. 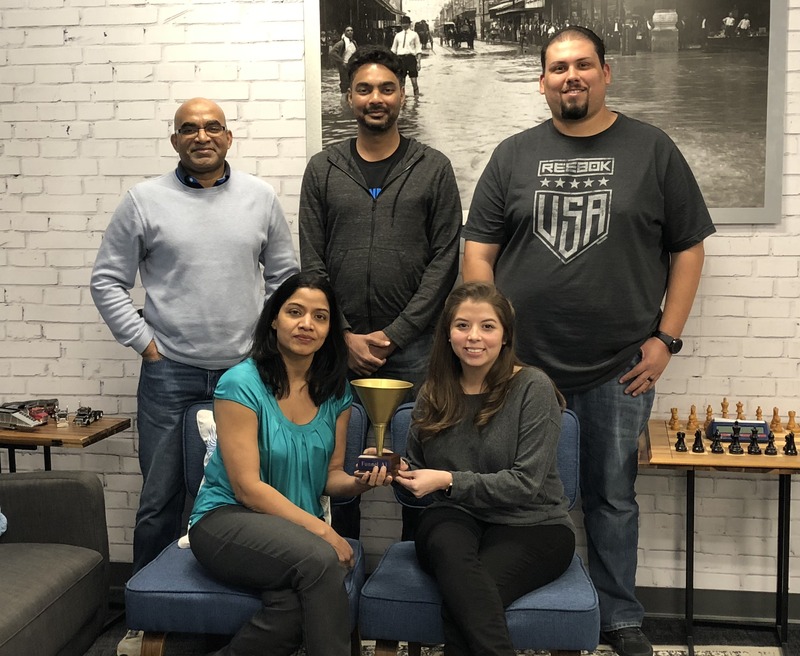 At USAA, upper management is training on various AI techniques to become familiar with the technology and the many ways in which it can be applied. One example is the company’s recently announced app that allows users to gather vehicle information such as purchase price, cost of insurance, and similar vehicles for sale in the area by pointing a smartphone camera at the vehicle. Electrical and computer engineering professor Jeff Prevost and other members of The University of Texas at San Antonio faculty have been delivering workshops to the USAA managers teaching them everything from basic data analytics tools to deep learning, which feeds a computer vast amounts of data to find patterns. Eventually, experts say, artificial intelligence will become simpler for the average person to employ. AI tools will come built into everyday programs, such as word processors and spreadsheet applications. In fact, software libraries such as Google’s TensorFlow already make machine learning accessible to programmers of varying technical skill sets. And UTSA is looking to staff its classrooms with more AI experts. The university has identified AI in its cluster hiring plan and will fill eight faculty positions advancing AI research, education, and outreach. Professor Mo Jamshidi is one of UTSA’s foremost experts in automation. The director of the university’s Autonomous Control Engineering center, or ACE Lab, Jamshidi and a team of students have been building an autonomous vehicle. It’s a miniature model that the professor will showcase in the spring for an audience that he said will include several scientists and sponsors from the Pentagon. If all goes well, Jamshidi plans to seek a grant to secure funding to build a life-size model of the self-driving car. But despite the technological advancement, the U.S. is on the verge of falling behind its global rival China and already trails the country in research and development in the space. And if China defeats the U.S. in the race to become the world leader in AI, it could have grave implications for national defense, the economy, telecommunications, cyberdefense, and developing a universally accepted ethical framework. U.S. Rep. Will Hurd (R-Helotes) wants to lead the charge in developing a national AI strategy, something lawmakers and think tanks believe will help the country reclaim its dominance in the space and dictate how the technology is used – in war, manufacturing, and cyberspace. Hurd expects to file a bill at some point this year when a new Democrat-led Congress convenes. Eighteen countries have carved out a national AI strategy. Five nations are working on theirs. The U.S. does not have one. Jamshidi used to travel to China several times a year for business. Now, he is hesitant to because of how aggressive the country has become in corporate espionage. He has heard rumors of information hacked and laptops stolen from other researchers. Anyone innovating in the space is pressed to take their inventions to market because of the potential for China or other countries to steal their intellectual property, he said. “That is something that would shake us to our core in our country and society – not only for China but for any other country” to take over as the global leader in AI, Jamshidi said. China, for example, could become the main exporter of artificial intelligence-powered technology, such as facial recognition software. Hurd said a national strategy would focus on workforce development, including curriculum from primary to post-graduate education, and training current workers for the transition automation will precipitate. Although the AI revolution is likely to unsettle various sectors of the economy, one of San Antonio’s tech companies in the space said the quality-of-life improvements it will bring will outweigh the negative consequences. The featured image shows the FunnelAI team. Standing are co-founder Sridhar Kamma, co-founder Suman Poluri, and Larry Gonzales. 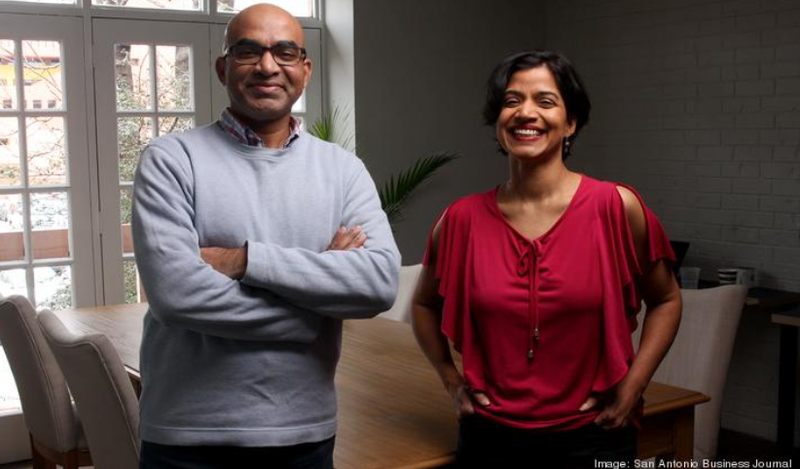 Seated are co-founder Sujatha Kamma and Vivian Canales. Gonzales and Canales are full stack developers and Codeup graduates. Courtesy FunnelAI photo.